Food coloring is a fun extra! You can use it to customize homemade cookies for holidays, to fit an occasion like a wedding or graduation, or to coordinate with a theme, such as your favorite team’s colors. When I started to learn more about adding color to cookie dough, cookie icing, and even decorative sugar, I was overwhelmed. There was much more to food color than simply squirting a few drops into a bowl of frosting. I wasn’t surprised that I could use nearly any color imaginable to tint cookies. 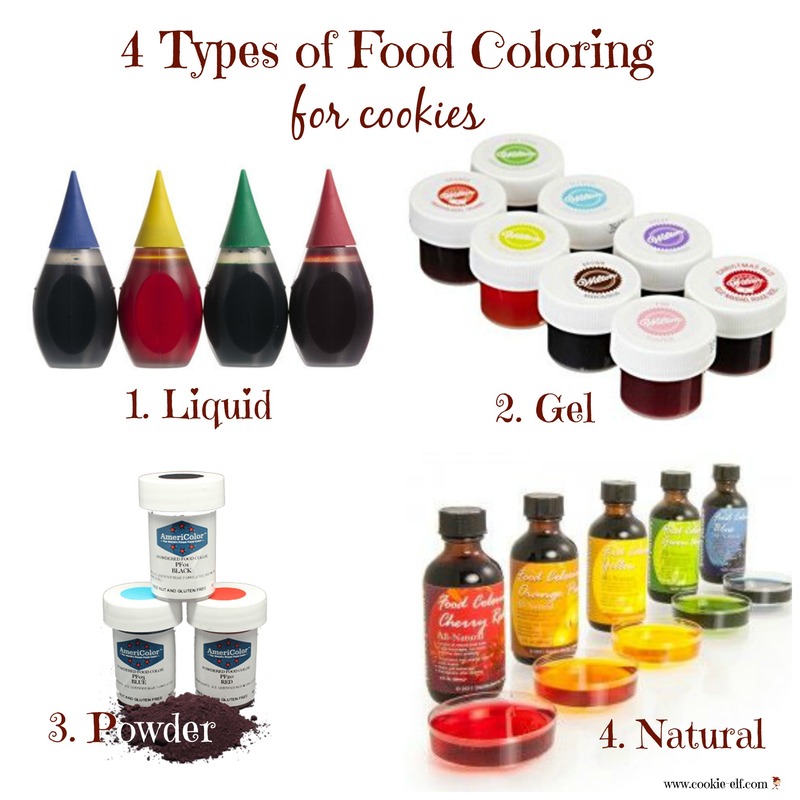 Instead, what surprised me are the 4 different types of food coloring you can use – actual different products. A bit of knowledge is power. In this case, power you can use to be adventurous and colorful when baking homemade cookies. This is what you may think of when it comes to food color – the small plastic squeeze bottles sold in grocery stores. Liquid coloring is water-based and less concentrated than other kinds. That makes it a good choice if you want light coloring for dough or icing. But take note: liquid coloring is weak when compared with gel, paste, and even powder. If you want strong color, you’ll need to add a lot, which can alter your cookie recipe since you’re adding liquid. Elf tip: use liquid food coloring if you want a light color or if the recipe isn’t fussy and can tolerate a bit of extra liquid. Sometimes called “icing color,” gels are made of water, glycerin, and corn syrup. They come in two forms: gel paste, available in small jars (easier to find) and liquid gel (sold in small bottles). Powdered food color is made from synthetic ingredients with no added water, glycerin, or corn syrup. They are ideal for recipes like meringues or melted chocolate in which extra liquid is a no-no. They’re good to use to color white sugar, too. Powders are sold in jars and have a long shelf life. Add them directly to cookie dough, icing, or sugar. Natural colorings are made from plant sources with no added synthetic ingredients. They are sold in dropper bottles and are a great choice for allergy-free baking.